How do I know if my swimming pool has a leak? Well the most obvious answer is that you have a larger than normal drop in water level. This water loss may not be obvious if your pool has an automatic fill device that keeps the pools water at a constant level. So if your pool has one, you should turn it off for 24 hours and keep track of the water level. An abnormal increase in your water bill. Cracks in the deck resulting from settling earth . An unexplained increase in your use of chemicals. Also remember that an uncovered pool will lose water due to evaporation over time. Evaporation is dependant on a variety of environmental conditions and can vary greatly from pool to pool and even from season to season. An easy way to tell whether or not your water loss is due to evaporation is by performing a "Bucket Test". The Bucket Test is a simple test that can be performed by you, the pool owner, before you call a pool leak detection professional out to look at your leaky pool. To determine the evaporation rate of a particular pool, place a bucket filled with water into the pool on the first or second step, (this assures the water in the bucket is exposed to the same conditions as that in the pool). 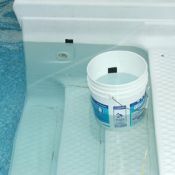 Fill the pool to its normal operating level and mark the water level in both the bucket and the pool. Measure the amount of water loss in both over a 24-hour period and compare the difference. If the bucket loses the same as the pool all of the water loss is due to evaporation and not a leak. This �Bucket Test� is something that you can do without you having to have a swimming pool leak professional make a trip to the pool..
To calculate gallons of water lost use the following calculation: inches of water lost x Area of Pool Surface (in square feet) x .62 gallons. Another indicator of your pool having a leak is air in the pump or being blown into the pool. A leak in the suction side plumbing (from skimmers and main drains to equipment), may pull air into the lines where it will show up in the pump or be blown back into the pool through the returns. This condition can also be caused by a blockage or obstruction in the suction lines. Either situation will require immediate professional attention to avoid causing mechanical damage to your pool equipment.